Posted on June 21, 2016 at 9:44 am. James Packer was seen doing his happy dance just hours after Crown Resorts announced it was separating its “high performing” local assets from its international businesses. 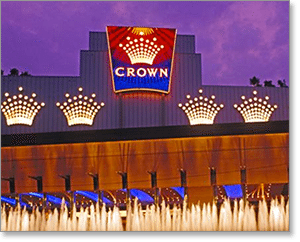 Crown Resorts share price has been the subject of much discussion, with the casino interests in Macau, which are struggling, dragging the share price of the highly profitable empire down. Last week Crown Resorts announced it expected shareholders dividends to grow by 34 per cent, which would be enough for a jump in share prices by itself. But coupled with the announcement it was separating the Macau interests into a separate company, the share prices ballooned out by over 13%, making Packer, who owns over 50% of the company, over half a billion dollars richer in a few hours. The troubles in Macau have been brought about because of a crackdown on corruption in Macau. Giant gambling company Amaya, which controls Pokerstars, has branched out into sports betting, launching Betstars.fr, in France. But it is unlikely to be available to Australians anytime soon, with Pokerstars dominance of the poker market in Australia meaning they are unlikely to draw attention to themselves by operating this part of the business unregulated on our shores. People in France can access BetStars through the French-facing Pokerstars client, as well as via an iOS and Android app. One of the biggest positives of the setup is there is one bankroll across the entire platform. Pokerstars launched BetStars.com in January and BetStars.it last month. Casino regulation changes in New South Wales means there are less specialist government inspectors on the floor of Star Casino in Sydney. It is being reported 19 out of 20 government inspectors and auditors, previously employed by Star, have left their positions, taking voluntary redundancy. The inspectors have now been placed in a larger pool which only do random spot checks. It is feared the less stringent conditions will open the door for organized crime to launder money through the casino. Gladstone, known as a gateway town to the Great Barrier Reef islands, is home to a new millionaire, but they may not even know it yet. The quick pick winner bought their ticket at Park Street News & Gifts for Saturday’s division one $22 million Lotto Super Draw. The man or woman stands to win just over $1.5 million. It is also being reported two of the Super Draw winners are in Western Australia, with both receiving the same share at the WA winner. Remarkably the Gladstone news agency has sold two winning tickets in three months after a $1.1 million win was recorded in March. Check out Gday Casino for live lotto and keno games – plus receive an unlimited deposit bonus at this respected casino. If you can’t sign up for an account with G’day, players from United States are warmly accepted at Raging Bull Casino for real money or free play.